Caterpillars are cute fuzzy little bugs that turn into beautiful butterflies but they can also be a gardener’s worst nightmare because the caterpillar needs to eat enormous volumes of plant material in order to be able to transform from larvae to butterfly. Certain types of caterpillars can completely strip a plant of all its vegetation in one night. It is useful to be able to identify the type of caterpillar you are dealing with. Caterpillars that have pale green stripes along their backs are cabbage loopers. They like to eat collard greens, kale and lettuce leaves. Corn earworms are caterpillars that you normally see in August and September. Cutworms can be identified by the way they eat your plants. These caterpillars chew off new shoots or seedlings right at their base. Pesticides are very effective at killing off caterpillars but they also kill off beneficial in your gardens like ladybugs, predatory wasps, and earthworms. Chemical pesticides are also absorbed into the leaves and stems of plants so they should not be used on plants you intend to consume. Here are 5 organic solutions to getting rid of caterpillars. 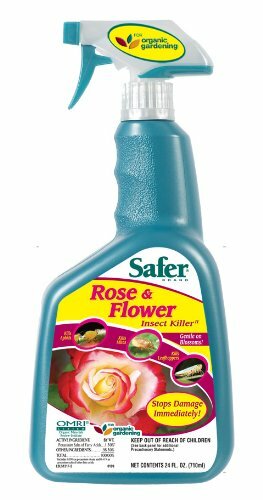 Safer Brand Rose & Flower Organic Insecticide. Check the price. location away from your prized plants or kill them by casting them into a bucket of water with a little soap. 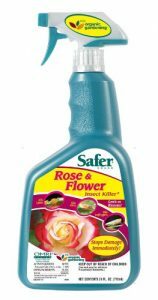 If you’re not up for picking them off your plants with the hands, you can use an organic insect killing soap tailored specifically for this use. Neem Oil is an organic pesticide that controls a variety of pests including thrips, whiteflies, leaf miners and caterpillars. Neem oil can also kill beneficial bugs so use it carefully. Spray the leaves of the affected plants with the neem oil and that should take care of your caterpillar problem. Referred to as Bt, Bacillus thuringiensis is a natural bacteria. It comes in a powder that you dust over the foliage of each plant. It will kill off the caterpillars without harming other beneficial insects. You can protect plants using sheets of porous polyester fabric. The shields allow light to penetrate through and reach the plants while keeping pests away from the foliage. You can create sleeves out of the material that slips right over the plants. A great way to keep getting rid of your caterpillars is to increase the number of birds and predatory insects in your garden. You can hang a bird feeder in your garden to attract birds to the areas around your plants that need protection. The birds will eat the caterpillars. You can always go to your local garden center and purchase a box of praying mantises to increase the number of predatory insects in your garden that also feed on caterpillars. There are several other simple things you can do to protect your plants against caterpillars. Crop rotation helps to reduce caterpillar infestations so develop a plan where you can move your food crops around the garden to different locations so you don’t plant the same thing in the same place year after year. Another simple step you can take is to plant herbs and flowers throughout your edible plants. Herbs and flowers have scents that repel caterpillars and other insects. Lavender, mugwort sage, and peppermint are all effective at repelling caterpillars and other insects away from your fruit and vegetable plants. If you’re not able to cultivate those plants, use the essential oils. Although caterpillars may look warm and fuzzy and are fun for kids to play with, they can do a lot of damage to your vegetable plants. Preventive action is the best course to eliminate caterpillars from your garden. Although no one has figured why it works to place cardboard around the base of each plant, it is an effective measure to prevent caterpillars from attacking your plants. Timing the planting of your garden is also a good way to avoid caterpillar infestations. Plant early, fertilize it and take care of it so your garden grows quickly. As a last recourse, you can turn to an organic pesticide to eliminate your caterpillar problem.